Snack Girl recently hosted a guest post on Tostitos that created a lot of controversy. It even generated an invitation to visit a Frito-Lay facility (hurray!). During the discussion, someone asked me about Multigrain Tostitos and I had no idea they existed. Here is the (slightly shortened) ingredients: Corn, Vegetable Oil, Corn Starch, Whole Buckwheat Flour, Whole Oat Flour, Sugar, Toasted Corn Germ, Whole Wheat Flour, Salt. Basically, you have a corn chip with a few added grains - buckwheat, oats, and wheat - and therefore it is multigrain. Does that make it healthy? There are some really great things to say about these chips. Mostly it is about what they aren't (Doritos). No MSG, Trans Fat, artificial colors, preservatives (other than salt) are in Tostitos. They are, in my opinion, a much better choice than Doritos. BUT, they are still a highly processed high glycemic food. Tostitos have carbohydrates that break down quickly during digestion and release glucose rapidly into the bloodstream. In other words, you are eating a food that is one digestive step away from sugar. The problem with high glycemic foods is that they have been linked with diabetes, cancer, and even heart disease. Tostitos are a treat - not a healthy snack. The ingredient list isn't going to fix the fact that the processing of the chip has turned it into something the body uses as sugar. Don't get tricked by the word MULTIGRAIN. It doesn't mean healthy - it just means many grains. The best grains you can eat are 100% WHOLE grain, unprocessed, and full of nutrients. See Toast for a discussion about how to identify whole grains in bread. These tasted much like just regular Tostitos, and I enjoyed them with A LOT of healthy fresh salsa. 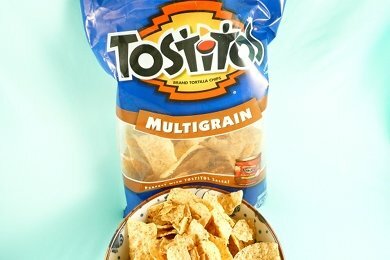 What do you think of Multigrain Tostitos? Excellent points once again! Thank you for bringing up the points about high glycemic foods-so important! You should try Soy Joy bars and tell me what you think! Can't wait to hear about your visit to the factory. Controversy can be a good thing...especially here where people are really learning about what they eat and what they consider to be healthy food. I think it's sad that companies try to trick consumers that are too busy to read the labels or don't have the education to understand the labels. Like you said, these are better than Dorito's, but are still a processed food. If I wanted a tortilla chip, I'd rather go and enjoy them at an authentic Mexican restaurant rather than eating packaged junk. Great points, I wish everyone knew these things. So many college kids know so little about nutrition that when they see claims like this they think they are healthy, or super foods. The labeling in the processed food industry gets me frustrated quite often. Thanks for setting this one straight. I love tortilla chips and I am very grateful for your information. Let's hope someone can find a truly healthy one! I like Multigrain Tostitos but, like you said, don't think they differ much from the normal ones. Either way, whenever I'm eating Mexican I always go for lots of salsa on a few chips! It's just part of the experience. There's no way to know for sure, but most corn-based snacks are made with genetically-modified corn. The food giants want you to think that there's nothing wrong with GM food, but GM crops are banned in all western European nations, due to health concerns. Food companies are fighting against mandatory labeling of GM foods because they know the public doesn't want them. Buyer Beware!!! Love your blog but want to comment on a recurring issue that could be slightly misleading. The first has to do with sodium. In spite of what the WHO, ADA, NIH, ADA (not a nonprofit group, by the way) and highly agendized orgs such as CSPI say, to date there is no definitive proof pf a connection between sodium intake and disease in healthy people. None. The science simply isn't there. In fact, the majority of science investigating such connections shows no clinical effect or the opposite. Even the most quoted studies. My favorite example is the DASH II. If anyone bothers to read the actual results and compare them to the conclusion, they'll find the DASH II contradicts its own findings! I am not connected to the salt industry, I'm just an old bench scientist-turned-nutrition journalist who has followed this canard for years. Don't take my word for it, read the science! You'll find of the well-conducted and controlled studies that do not start out with the assumption of a connection (and most of those that do) a connection to establish a link fails. Studies such as DASH II and INTERSALT are often misquoted, by the way. One key is the term "significant" difference. It means something very different in science. If your boss gives you a "significant" raise, you pop the champagne. But in studies, a significant difference is merely one that can be measured as having been just north of coincidence. What you need to look for is "clinical significance," that which is long-term and will impact health. My second comment is on use of the glycemic index. I just think you need to throw a reminder in there that the GI was established as a tool for PEOPLE WITH DIABETES, not a weight-loss device. My favorite example: Greasy deep-friend potato chips have a lower glycemic index than a resistant starch-, mineral, vitamin c- and potassium-packed boiled potato that provides super-high satiety and glycogenic carbs that are less likely to be converted to fat. "you are eating a food that is one digestive step away from sugar" -awesome statement, really resonated with me! Its hard to believe something that tastes so different has a very similar effect on the organism as sugar!